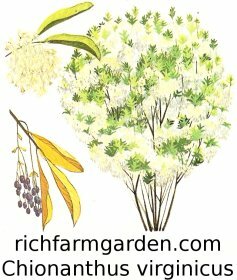 Fringe Tree - Chionanthus virginicus - A native shrub of the eastern US bearing long panicles of fragrant white or greenish-white blooms in early spring.Prefers deep loamy soil in full sun. Hardy to -20F (-28.8C); height: 15ft. Chinese Fringe Tree - Chionanthus retusus - Masses of white blooms borne in 9in. erect panicles followed by blue berries in the fall. Leaves are dark green with a downy white underside. An uncommon tree in the US. Hardy to -20F (-28.8C); height: 15ft.